Sweetened with Love: New Gadgets! 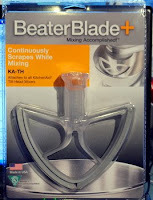 On a couple of the blogs I visit I had been reading about a new product called BeaterBlade+ a new beating attachment for the KitchenAid. The standard KitchenAid attachment does a standard job - it mixes well but you have to stop the machine quite often to scrape down the sides...can get annoying and is quite time consuming! The BeaterBlade has rubber scrapers along the edge of the plastic attachment which are supposed to mix and scrape down the sides of the bowl at the same time. Could this be possible?! YES! I used the beaterblade to make the father's day cupcakes an cookies on the weekend and i didnt have to stop the machine to scrape down the bowl once! It really is wonderful. I highly recommend it. I also found an online site that had cream Robert Gordon cupcake stands, yay! I'm sure i will find an excuse to use it soon :) Please visit http://www.isaacandmai.com.au/ if you are interested.